This chapter examines purifying as a third major component in the teleoaffective structure of child caring. Purification is a set of ritualised practices performed on babies and products, and in material-embodied and symbolic ways, creating a range of material and symbolic orders that keep the pure child pure. The chapter is organised in two parts. I start by following the recently growing interest in re-usable nappies in an analysis that gives some insight into the hybrid reality of early parenting where practical, embodied, environmental and symbolic concerns are brought together. I mostly draw on my interviews with prospective and new parents to discuss plans and values towards childcare and products, focusing on baby excrement, which, as argued by Murcott (1993), points to the concomitant realisation of infants as pure and polluting. 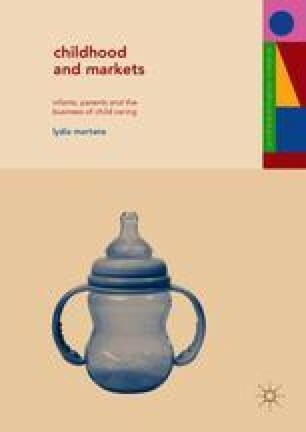 In the second part of the chapter, the focus shifts to an example of the purifying work performed in sales practices to render products natural and normal, thus enhancing their suitability as components in child caring practices. I here return to infant feeding tools and present an analysis of recently converging sales narratives in which the tools are ‘naturalised’ through design changes that are argued to make these closer to the embodied qualities of infants and the process of breastfeeding.